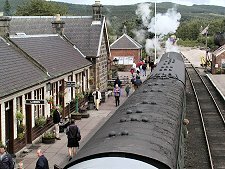 The Strathspey Railway is a restored steam railway using part of the old route from Aviemore to Forres. It now carries passengers between Aviemore, Boat of Garten and the current terminus at Broomhill on the banks of the Spey opposite Nethy Bridge and approximately three and a half miles south of Grantown on Spey. 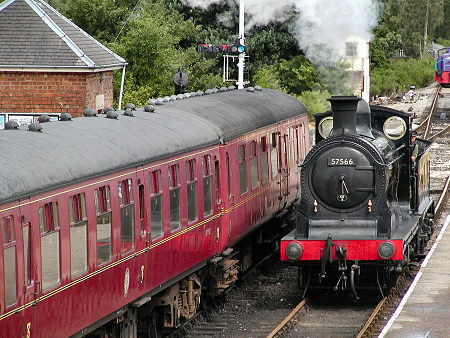 Up to four trains run each day throughout a long season. There are also enthusiasts' weekends, plus Santa Trains and Mince Pie Specials around Christmas. Trains can also be chartered on a one-off basis. The Strathspey Railway owes its origins to a group of enthusiasts who came together in 1971 to buy, restore and run the line. In July 1978 the Strathspey Railway officially opened for business between Aviemore and Boat of Garten. 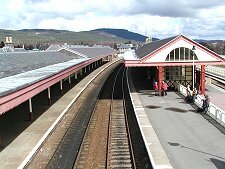 British Rail policy at the time meant that the Strathspey Railway could not use Aviemore's main station, despite it having a spare platform. Instead the service operated from a separate station a little to the north. This changed in 1998, and the Strathspey Railway now operates from the most easterly (i.e. the far side from the town) platform at the main station in Aviemore. The journey takes you out of Aviemore past the large locomotive shed that is home to Strathspey Railway's engineering works (not normally open to the public), and along the west side of the Spey Valley to Boat of Garten. Since 2000 the route of the line has been closely followed by the southernmost stretch of the long distance Speyside Way. In Boat of Garten the station lies close to the centre of the village, near the Boat Hotel. Parking is available via a road running past the Boat of Garten Golf and Tennis Club. At Boat of Garten Station you really get the full sense the railway is trying to recreate, of British Rail as it was in the 1950s and 1960s. You can wander around the station or look at trains being worked on in the sidings. The most recent stretch of the line to open is from Boat of Garten to Broomhill, about half way to Grantown on Spey. 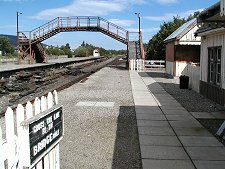 This will be known to many fans of the TV series Monarch of the Glen as Glenbogle Station. The intention is to work to extend the line further, though significant civil engineering work will be needed to restore it as far as Grantown on Spey. Much of the success of the Strathspey Railway is down to its extensive network of Members, both in Scotland and further afield throughout the world. 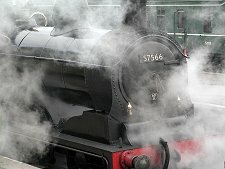 Membership is available on an annual or lifetime basis, and Members undertake much of the work needed to make this one of the best steam railways anywhere. 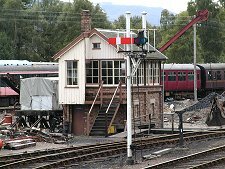 Members can also make use of much reduced rates for travel on the railway, and can use the low cost hostel designed to house volunteers from outwith the area working on the railway.